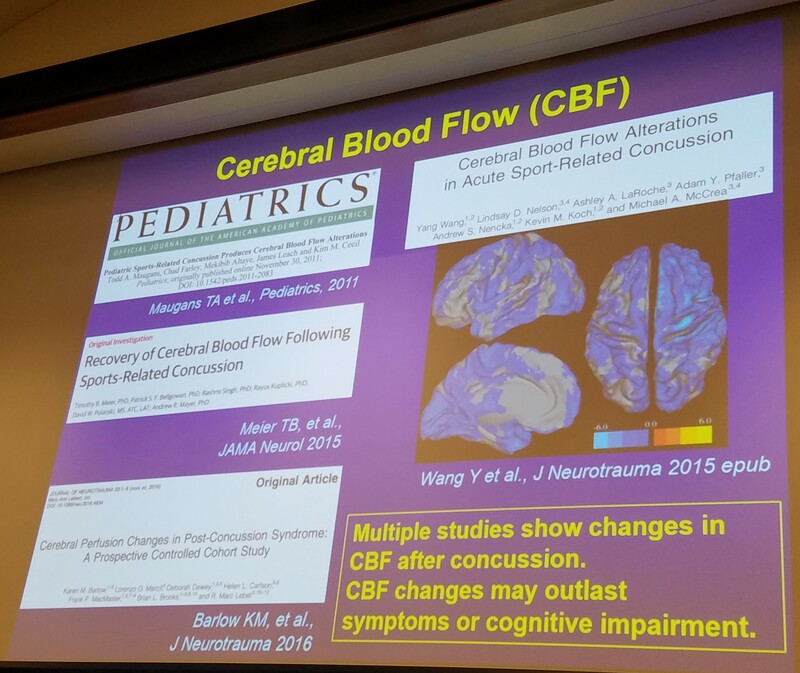 This post was written by Lauren Ziaks, DPT, ATC, on February 11, 2017 after attending the UCLA Sport-Related Concussion Conference in January, 2017. This type of information and more will be available once the all new Phoenix Concussion website launches Summer 2017! Lauren and Melinda will soon be doing their own, Phoenix Concussion Podcast, which will be found on Concussion Talk Podcast on YouTube, SoundCloud, and iTunes. The following information comes from our friends at the first ever UCLA Sport-Related Concussion Conference from January, 2017. Thanks to Dr. Christopher Giza and Dr. Stefan Duma for sharing their knowledge with us! 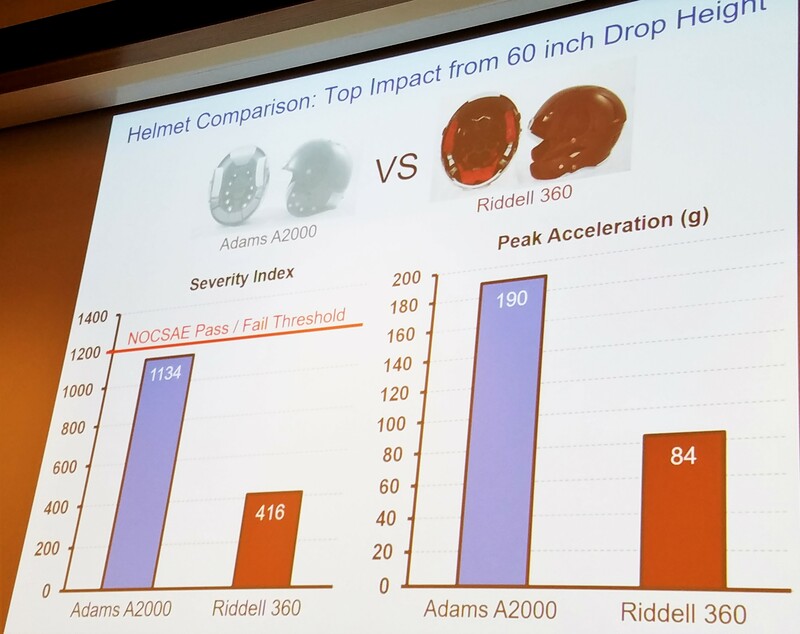 Helmets are not all created equal. 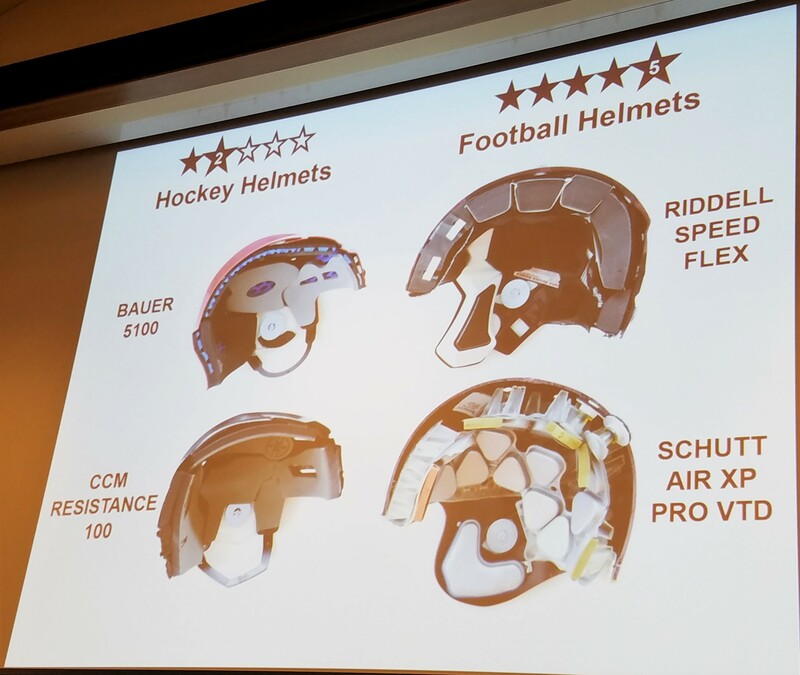 In this section we will only discuss the safety ratings provided for hockey and football helmets. We cannot recommend helmets for fit or style. It is important to remember that helmets do not prevent concussions but that they DO help to decrease the risk of increased brain trauma. Helmets are crucial to the safety of all athletes including bikers, skiers/snowboarders, lacrosse athletes, football, and hockey athletes. As Dr. Duma reported, football helmets are unlikely to improve any further in their technology. Football helmets have become incredible pieces of technology over the last 10 years. Our other sport helmets do not have this same endorsement. As you will see, hockey helmets, in particular, have a long way to go. Just a few weeks ago, we had to educate hockey athletes to STOP taking the pads out of their helmets. The fact that hockey athletes consistently play with the padding in their helmets is even more alarming when you are able to see the poor quality of helmets on the market. There is not 1 helmet with a NOCSAE rating over 3 stars! This only makes our message more important. The helmets already are limited in their ability to protect you, so leave the padding in place. It is also interesting to see that the only 3-Star helmet, the Warrior Krown 360, is significantly less expensive than some the lower quality helmets in the 2 star range at $79.99. Why wouldn’t we make it mandatory for all our youth teams to purchase the 3 star helmet? As you can see, football helmets are already excellent. 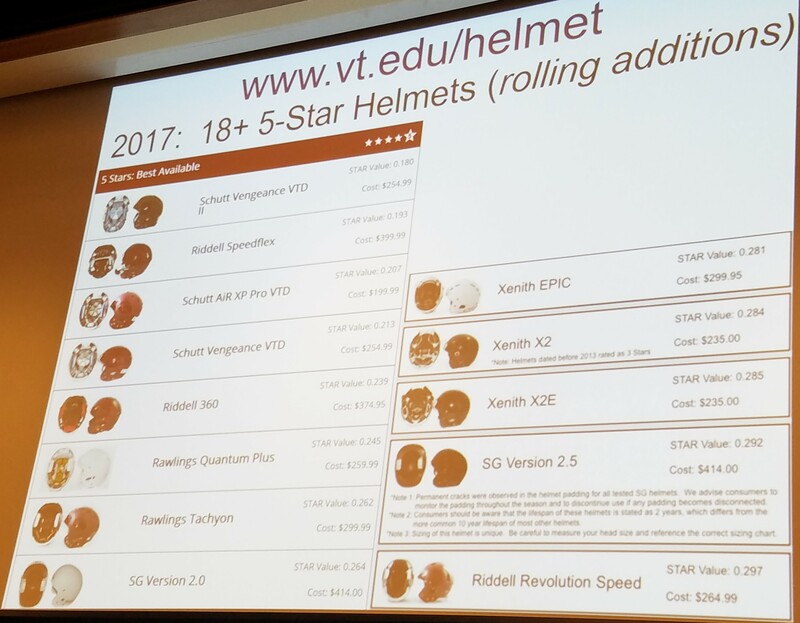 There are 18 5-Star helmets already on the market! These helmets range from $200-$400 and come with recommendations for examination by the manufacturer and refurbishments. 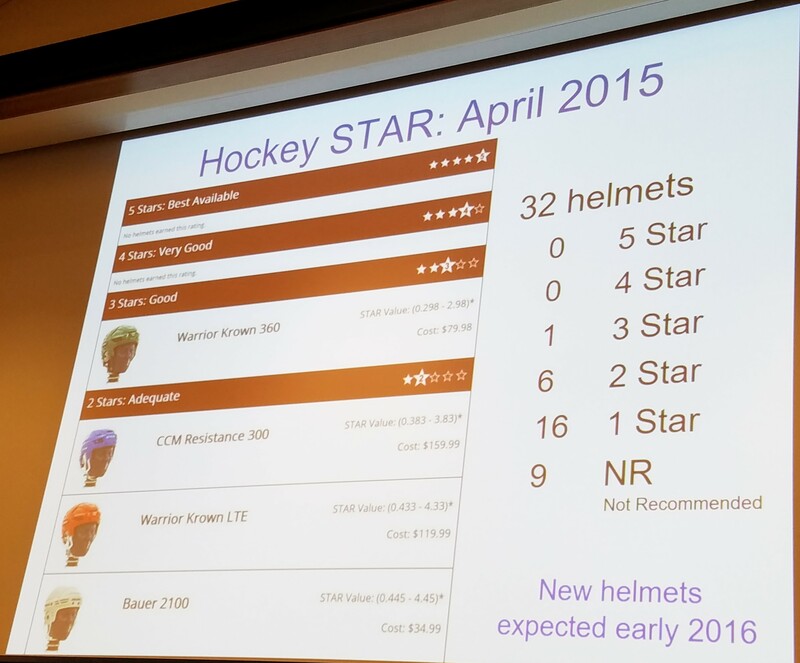 In comparison, there are only 1 3-Star helmet, 6 2-Star, and 16 1-Star helmets on the market for hockey! How can our technology and safety standards for this contact sport vary so greatly from football? So what are we protecting against? Why can’t helmets prevent head injuries? 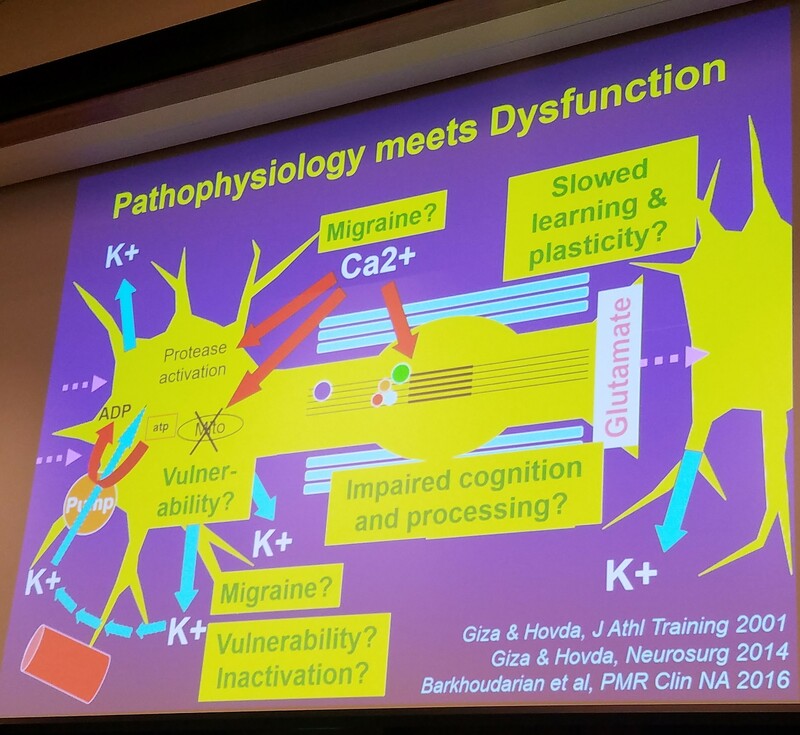 This is where it is important to understand what occurs inside the head and at a cellular level during a head injury. Understanding this information can help us to prevent head injuries! 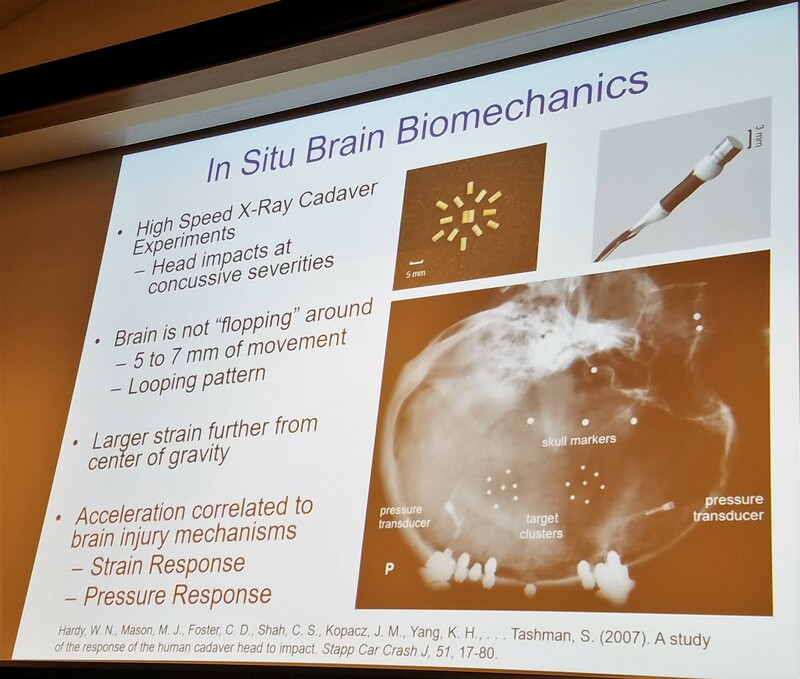 After reviewing all of the research available, Dr. Duma was able to show us that the center of the brain actually moves very little within the skull during a traumatic event. Just as ripples expand on water, the amount of movement of the brain’s tissues increases as you move further from the center of the brain. When you think about how little movement occurs and how widespread and significant the trauma can be, it makes the brain even more interesting and exciting! How exactly does this small amount of movement cause microscopic damage within the brain? This question can be explained by the incredible information provided by Dr. Giza. These small movements of the tissues lead to a cascade of damage at the cellular level in our brains. First, we have an influx of ions and our cells have to work extremely hard to get these ions out. Eventually, the pumps shut down due to overwork causing an “energy crisis” in our neurons (computers). This energy crisis shows up as headaches, brain fog, decreased thinking capacity, and “hitting the wall”. Patients then need to rest until their energy stores are built back up. The neurons are now not functioning properly and our energy is all used up in our brain. There is also change to the blood flow in our brains all at the same time. The decrease in the cerebral (brain) blood flow along with the chemical changes and damages to the synapses (train stations) cause a period of vulnerability where another injury is more easily sustained and can lead to more significant damage. 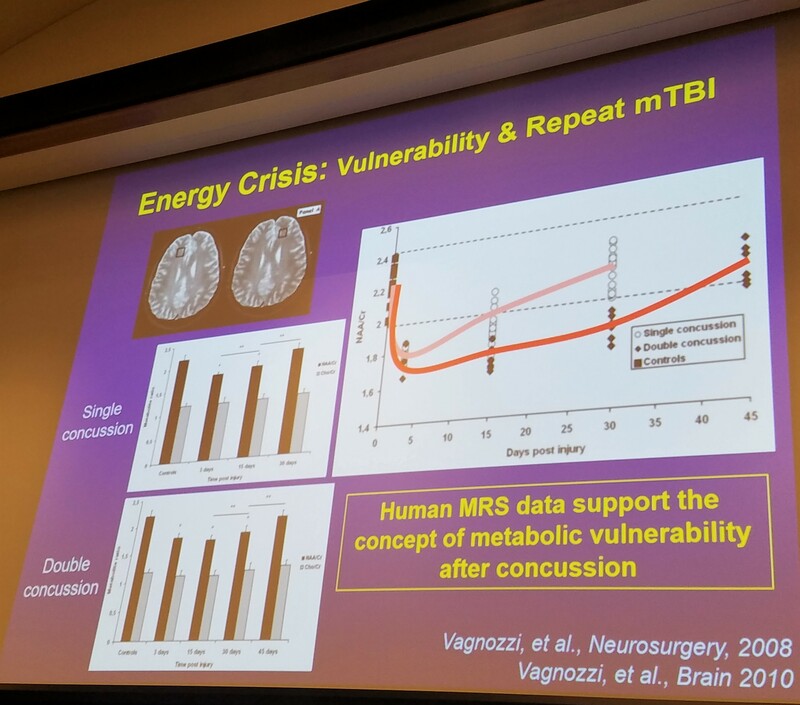 If another injury occurs during this metabolic crisis, this damage will only increase and cognition will decrease. Research thus far has shown this period extends 7-10 days. However, researchers do believe this period may extend for up to 30 days after a single incident! When looking at metabolic changes, a single incident will return to baseline at 15-30 days but a second injury during this period of vulnerability will increase the time loss to 30-45 days. Are you having trouble getting athletes to understand the reason they need to rest for a minimum of 10-14 days despite resolution of symptoms? Simply explain the risk of an additional 2-4 weeks out of the game due to re-injury and you will often be heard! To re-cap: There are changes metabolically in the brain, changes to the blood flow, damage to the synapses, and tearing of the white matter (super highways). All of these changes combined can result in functional deficits that are both acute (immediately) and chronically (long term ) post head injury! What we know is that the most vulnerable time after an injury is in the first 10-14 days. 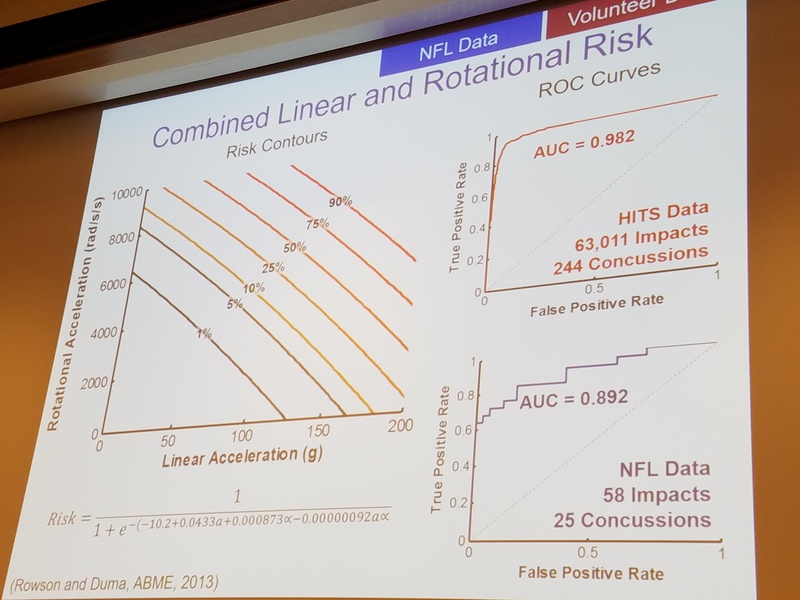 This has been consistent with the average return to sport time during the NCAA-DOD study when accounting only for symptoms and concussion testing. What we also know is that re-injury during this vulnerable time can lead to much more significant trauma to the brain and a significant increase in time loss of sport and school. The final crucial piece of information to help limit head injuries comes from understanding how different hits cause damage to the brain. We can thank the car industry for a large portion of this research. Lower velocity hits cause less damage. This piece of information should be obvious. However, the NFL and helmet research has brought some incredible new information to light. Linear hits (straight forward and backward) cause less damage than rotational hits. If the head is rotating at the time of the hit or if the athlete is struck from the side with forward movement, more damage is seen in the brain and manifests as an increase in concussion symptoms and an increase in time to return to sport. Recommendation 1: Avoid re-injury during the first 10-14 days when the brain is most vulnerable to another concussion. Recommendation 2: Lower the acceleration (speed) of all hits and decrease impacts with rotational components. Recommendation 3: Purchase the safest helmet possible for your child. If you made it this far, thanks for reading! Check back for more when Phoenix Concussion launches!